Shakin & Bakin Foodie Blog: Tupperware Modular Mate Oval 2 Containers! Tupperware Modular Mate Oval 2 Containers! One of my favorite shapes in the Tupperware Modular Mates (tm) Containers are the Oval Shapes. I really enjoy using these containers all over my house to get organized. You can use them in your kitchen to store dry good foods but you can also use them under your bathroom vanity sinks, in your closets, laundry room, garage, and work shed too! The Tupperware (tm) Modular Mate Container Oval Shape size 2 container measures 4 1/4" high by 7 1/4" long by 3 3/4" in size with a maximum capacity of 4 3/4 cups. You can also color code your items by purchasing them in/or the brilliant blue or passion red seals. 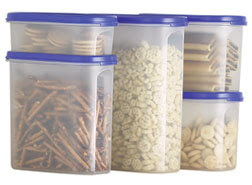 Below are some suggested uses on how you can get organized in 2008 using this specific sized Modular Mate container. These are just suggestive uses to get you started! Do you love to make your own gift mixes like those gift mixes in a jar? If so, try making them with the Tupperware Modular Mates Size 2 Oval Shape!